Kirk Bell September 14, 2017 Comment Now! 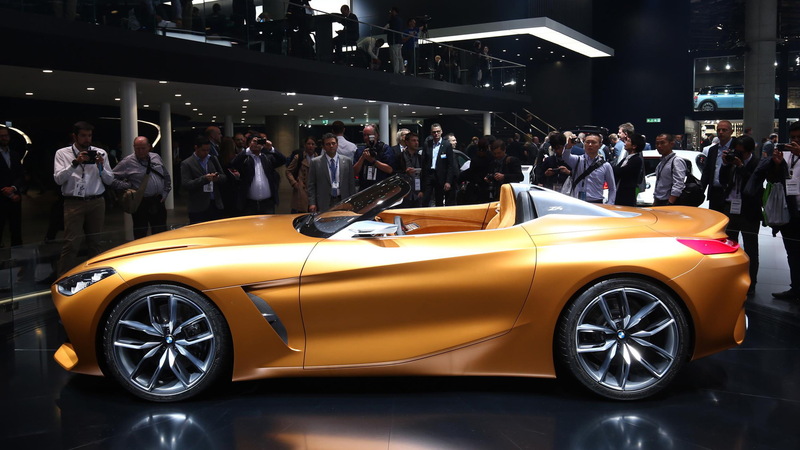 Following a debut in mid-August during Monterey Car Week, BMW took the wraps off its Z4 concept this week at the 2017 Frankfurt Motor Show. 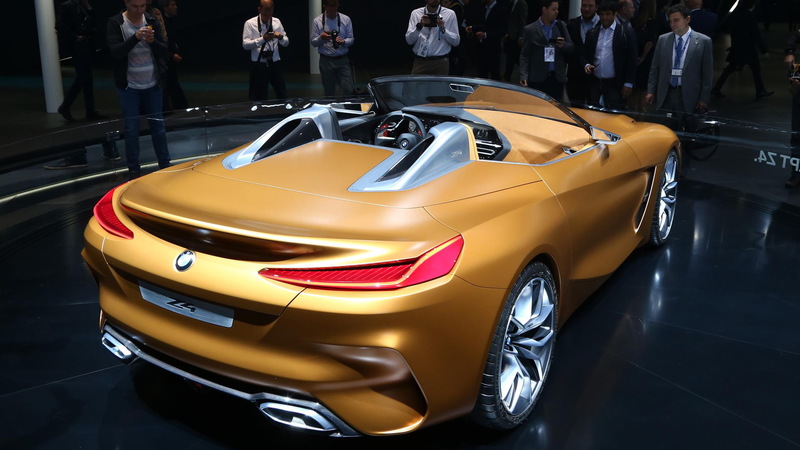 The car is hinting at the next generation of BMW's two-seater sports car. 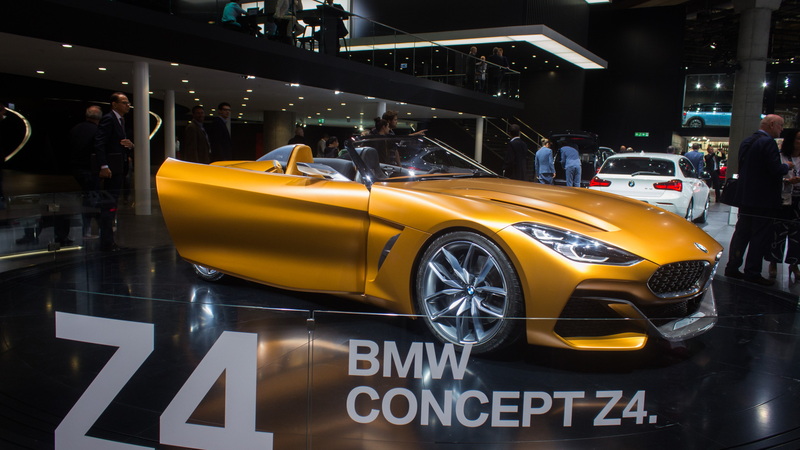 Specifically, it previews the new Z4 that BMW says is coming in the next 12 months. 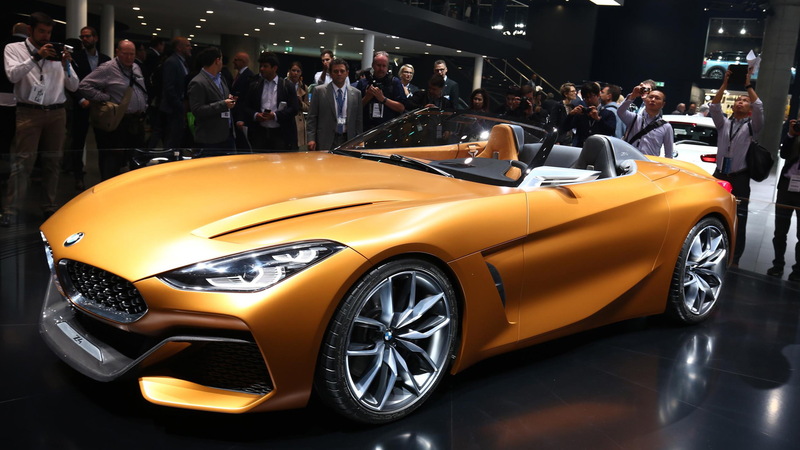 Crucially, the next-generation Z4 will share its platform with a reborn Toyota Supra. The Z4's look is all sports car. At first blush, a distinct wedge shape is apparent, with the classic proportions of a long hood, short rear deck, and short overhangs. The hood is shorter than the outgoing Z4 and that, combined with shorter overhangs, mean the driver sits closer to the center of the car instead of farther back. The details start to define what could be next for BMW design. The grille is tilted forward, with the headlights set high and the twin kidneys lower, taking on the shark-nose look of the BMW Z8. The nose is finished off with three large air intakes, a slimmer central one and two wider ones at the edges of the face. That central intake has a carbon fiber insert. A clamshell-type hood has gill-style vents at its edges. Its lower cutline matches the body character line that defines the car's wedge shape. It also sits above an air breather aft of the front wheel. The character line rises over the rear wheel, and another lower-set character line curves up to meet the rear wheel haunch. From the top view, dome-shaped roll bars mimic the seat design and flow back into the body. The flared wheel arches give the car a wider rear aspect, and a slightly flared rear spoiler completes the wedge look. Slim LED taillights point inward, and combine with the license plate panel and the shape of the dual exhaust to create an X shape at the back. A carbon fiber diffuser finishes off the rear end. BMW has painted the car in a flat, or "frozen," Energetic Orange paint and set it on 20-inch alloy wheels with a double-spoke design. The orange exterior color is carried over into the interior, with the transition separated by a chrome strip. The driver’s seat, door trim panels, instrument panel, and center stack are all finished in black, and BMW says these components wrap around the driver to create what BMW calls a "cone of vision." The driver's seat has a laser-cut hexagonal pattern, while the passenger seat is orange, and the trim includes carbon fiber door sills. The dash features two screens, one for the instrument panel and one on the center stack. A head-up display is also provided. The controls are grouped into “function islands” so nothing distracts from the driving experience. We see no pictures of the top, but it is supposed to be a soft top this time around instead of a retractable hard top, which should help cut weight. BMW doesn't mention the engine, but we expect the 2018 Z4 to offer 2.0-liter inline-4 and 3.0-liter inline-6 engines, both turbocharged, making 248 and 335 horsepower, respectively. 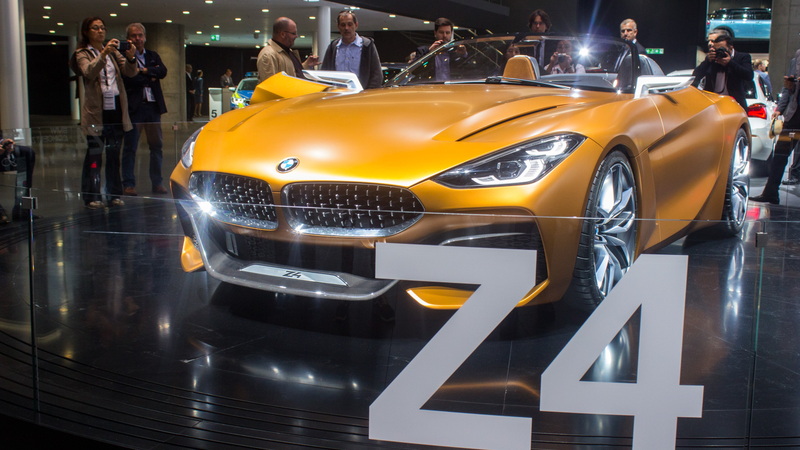 The Z4 concept has an automatic transmission, but the production car is expected to get a manual as well. We just hope the production car drives as well as the concept car looks. For more coverage on the Frankfurt Motor Show, head to our dedicated hub.